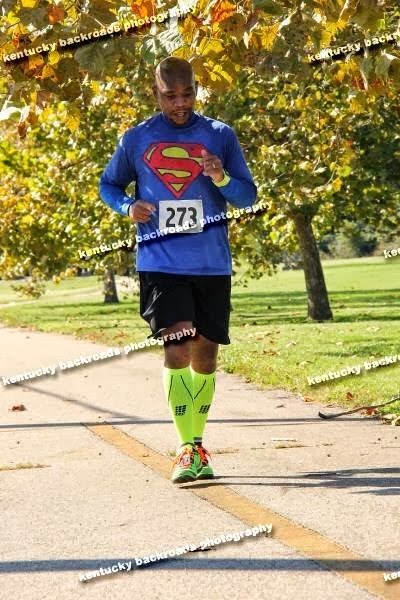 My review of the Louisville Dream Factory Marathon!! Well I just turned 41 on October 17th, and this past Sunday (10/20/2103), I completed my 3rd Full Marathon! Which is nice, because this Saturday, I will be running my 3rd Half Marathon, and two weeks after that, I will be doing my 4th Half Marathon. That being said, below is my video recap of an AMAZING day! Here is the pic I am talking about where I am at mile 25.2 and I was talking to myself, just saying my mantra over and over, "My Time, My Shine!" Love everything about this :) ... I remember seeing you cross on your first marathon, so to see how far you've come is so awesome! At first, I wasn't sure I liked the necklace thing over the big medal thing, but you're right - it goes on the wall... that is cool you can wear it ... what a neat way to show your accomplishment!!! loved your superhero trilogy plan of action! as I can relate so much to you! CONGRATS on a 40+ min PR!!!!!!! CONGRATS on top 10 in AG!!!!!! just so ya know,my oldest has the same birthday as you, he turned 10!!!! time sure does fly by! it feels as it was just yesterday I was bringing him home from he hospital scared out of my mind but so in love! and now he is coming home from school wearing bracelets( like the one your daughters made for you) from a "friend who is a girl"... 6 more yrs and he will be driving. im so not ready for this. will someone pleeeeease slow down the clock? have fun and just run!!!! !